← Can Women Be Orthodox Rabbis? Let me now return to the matter of halakhic decisions and ideology. As mentioned, Rabbi Gordimer is mistaken in stating that Modern Orthodox poskim evaluate matters the same way as haredi poskim. They don’t, and this isn’t even something that they should aspire to. Does this mean that a posek’s general ideology should disqualify him in some people’s eyes? For example, if someone is a recognized posek, does the fact that his ideology on Zionism is diametrically opposed to yours (e.g., R. Moshe Sternbuch) mean that you shouldn’t ask him questions? Historically, ideological matters were kept separate from halakhah. The various rabbinic organizations in Europe and the United States were comprised of rabbis who held different views about Zionism and other matters. If you were a Mizrachi supporter but the rav of your town was an Agudist, you still asked him all of your halakhic questions, because he was your rav. By the same token, if you were an Agudist and the rav of the town was Mizrachi, he was still the one to answer your halakhic questions. This is how matters worked in Lithuania and Poland and then in the United States. One of the unfortunate results of modern haredi Judaism (and it has precedents in Germany and Hungary) is that this model was destroyed. A basic feature of “official” haredism, especially in Israel, is the attitude that even if someone is a great posek, he is still disqualified if he doesn’t follow the correct Da’as Torah. It is hard to imagine a greater degrading of respect for Torah scholars than this (which thankfully is not shared by all who identify as haredim, even though it is reflected in all the Israeli haredi newspapers and “official” publications). It is precisely this approach, that of degrading one’s ideological opponents despite their great Torah knowledge, that stands at the root of all the terrible disputes in the haredi world. It also explains why, in recent years, haredi figures and newspapers felt that it was OK to speak so inappropriately about outstanding sages such as R. Ovadiah Yosef, R. Meir Mazuz, R. Shlomo Amar, R. Aharon Leib Steinman, and R. Shmuel Auerbach. Unfortunately, this approach has now entered the Sephardic world as well, where in the last Israeli elections we saw the worst aspects of Ashkenazic haredi society, i.e., personal denigration for ideological reasons, arise for the first time in the Sephardic world. I will discuss this in detail in a future post when I speak about R. Mazuz’s religious and political outlook, his role in the last Israeli elections, and the vicious things said about him and his yeshiva. While it is true that it was Ashkenazim who began the personal denigrations, it is a Sephardi, R. Shalom Cohen, who brought it to a new low. I will discuss this in the upcoming post, but for now, suffice it to say that for all the Ashkenazic haredi disrespect for opponents, I don’t know of anyone who has referred to an opponent’s yeshiva in the way R. Cohen referred to R Mazuz’s Yeshivat Kise Rahamim, a yeshiva that has educated thousands of students and today is of much greater significance than R. Cohen’s Porat Yosef. For those who haven’t heard, and it is difficult for me to even repeat this, R. Cohen publicly referred to the great Kise Rahamim yeshiva as a בית הכסא. Can anyone imagine a more disgraceful statement about a place of Torah? This is what happens when people think that they can degrade those who don’t adopt a certain Da’as Torah perspective. Here is a letter I recently received from R. Mazuz, which I publicize with his permission. גדולה שנאה ששונאים חרדים את החרדים משנאה ששונאים חילונים את החרדים. It is unfortunate that the disqualification of great Torah scholars due to ideological reasons has also been seen in the Religious Zionist world, though not to the extent that it is found in the haredi world. For some Religious Zionist figures, haredi poskim are disqualified in the exact same way that haredim disqualify Religious Zionist poskim. R. Dov Lior quotes R. Kook as stating that the rabbis we today refer to as haredim cannot arrive at the truth of Torah in any matter. שמי שחי בדור שלנו ואינו מביט אל האור הזרוע של תהליך גאולת עם ישראל, לא יוכל לכוון בשום דבר לאמתה של תורה. גם אם הם יכולים להתפלפל בעניייני שור שנגח את הפרה, בענייני ההנהגה של כלל ישראל הם לא מכוונים לאמיתתה של תורה. R. Lior’s statement was made in response to haredi indifference to the Gush Katif expulsion, and he claims to be simply citing R. Kook. Yet if we look at R. Kook, Iggerot ha-Re’iyah, vol. 2, no. 378 (p. 37), we find that R. Kook’s statement is much narrower, and I have underlined the point that R. Kook focuses on. ואם יבא אדם לחדש דברים עליונים בעסקי התשובה בזמן הזה, ואל דברת קץ המגולה ואור הישועה הזרוחה לא יביט, לא יוכל לכוין שום דבר לאמתתה של תורת אמת. Even R. Lior’s statement is not entirely clear, since he begins by saying that the haredi rabbis can never arrive at Torah truth, but in the end he only seems to be referring to Torah truth when dealing with communal and national matters. R. Kook would agree with this latter point, but I know of no evidence that he would say that in general the haredi rabbis can never arrive at Torah truth. 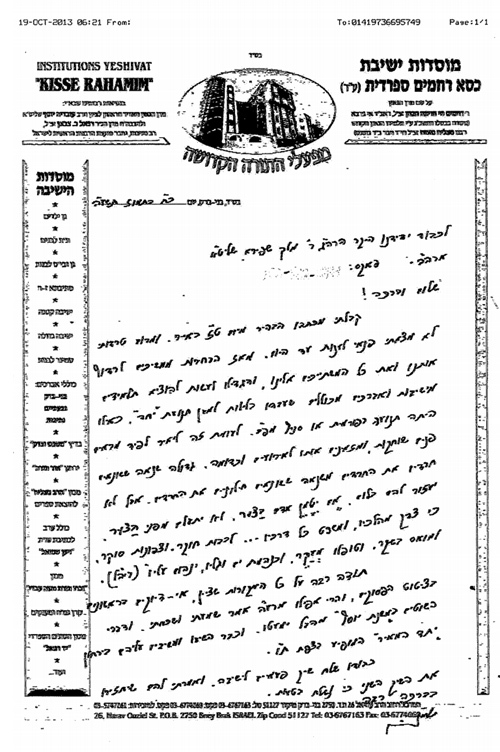 R. Zvi Yehudah Kook, basing himself on the same letter of R. Kook cited by R. Lior, stated that one should not ask a haredi posek any halakhic questions. This is just the flip-side of the common haredi position that one should not ask a Religious Zionist posek any halakhic questions. As mentioned already, the haredim were the first to push this approach, and I find it unfortunate that some Religious Zionist leaders have responded in kind. This entry was posted in Marc B. Shapiro, Rabbis. Bookmark the permalink.